Looking for professional, world class & on time corporate photography? Your search ends here! 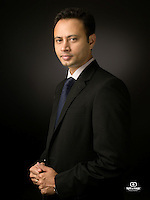 Light and Magic has over 9 years of experience and expertise in corporate portrait photography for Managing Directors, CEO’s, Board of Directors, Management Teams, etc. We provide photography service in the corporate world for corporate image development, annual reports, corporate image libraries, marketing collateral, web site content and branding campaigns. Our specialization includes corporate portraiture and corporate narrative photography of people at work or to promote concepts across multiple market segments. Being in the industry for almost a decade, we understand the need to communicate what a business leader symbolizes or what the corporate concept conveys, the images then reflect the company’s journey. We work on both photography and videography assignments throughout the country for Annual Reports, PR, Marketing Materials and Brochures, HR Events, Employee Family Get togethers, Company Publications, Websites, Catalogues, Company ID photographs and Press Releases. Alok Industries, Citibank, HSBC Bank, IIT Alumni Association, M/S. Oliver Wyman, Matrix India Asset Advisors Pvt., Ltd., Binani Group, Tata Motors, Indiabulls, Johnsons Control, Gorgeous Skin Care, Essen Vision & more.